Camper & Camping Wall Art and Quote Decals .... featuring decor for Campers, RVs, Fisherman, Lake Homes, Cabins and Beach Houses. Our Camper Wall Decals category has funny wall decals along with elegant wall decal designs. Browse, Order and Redecorate today! 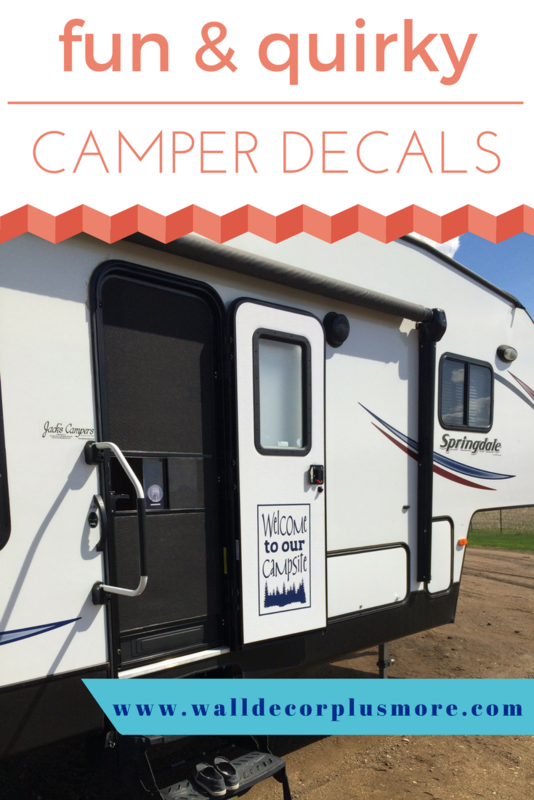 Planning to add your sticker to the OUTSIDE of your camper? We recommend requesting your decal in our outdoor grade glossy finish material at checkout. Our Glossy Vinyl material is an outdoor-grade sign vinyl material designed to withstand and hold up to any outdoor elements for 6-10 years, with a clean solid application. Whereas our typical Wall Vinyl material is designed for Indoor use and has a temporary outdoor life of 2-3 years only. Click here for ordering details for long-lasting outdoor camper vinyl decals.